Greer graduated from Glasgow School of Art in 1987 with an Honours Degree in Fine Art. An interest in art, however, began much earlier at the age of four when she received her first paintbox from Lord Wheatley, a thank you gift for having presented a bouquet of flowers to his wife. Throughout her career Greer has received numerous art related awards including the Greenshields International Scholarship for figurative art. In her early career Greer worked as a portrait painter. She has exhibited in the National Portrait Gallery in London and had several portrait commissions auctioned by Christies in London to fund raise for a major charity. Actress Honor Blackman was ‘pipped at the post’, at one of these auctions, for the opportunity to be painted by Greer. Greer’s figurative work is extremely popular and has been bought by buyers in the UK and abroad, including well known business and sports personalities such as Arnold Clark and golfer Darren Clarke. Greer is also known for her equestrian and polo pieces and was commissioned by BSJA ( British Show Jumping Association) Scotland to paint the horses ridden by Olympic gold medal winner Scott Brash. 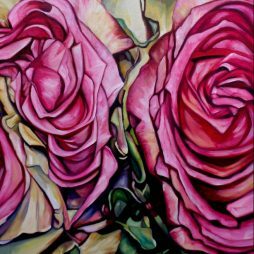 In the last year her interests have shifted from figure/equestrian to large scale flower paintings taking her down a new route of colour and expression. Influenced in part by artists such as Georgia O’Keeffe and Rachel Ruysch. As well as working as an artist Greer runs a variety of private art classes, including Life Drawing, and gives demonstrations to various art groups across Scotland.